The author eye-to-eye with some of inhabitants of a fly space for macaws. 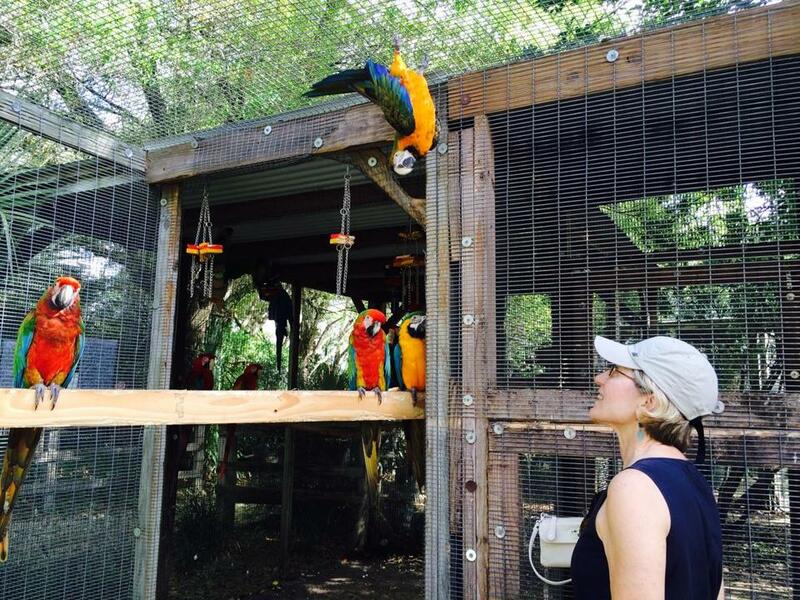 NAPLES — Keri Lohrman loves her birds. That’s a good thing, because she’s got 300 of them. At Bird Gardens of Naples, the nonprofit organization she owns and runs with her husband, Griffith, small lovebirds and cockatiels, large macaws and cockatoos coexist in generous flight spaces among lush foliage on the couple’s five-acre property. Mix colorful plumage with squawks and chirps and all manner of avian behavior and you’ve got a bird exhibit with a big personality. The grounds resemble a miniature tropical forest. Brick and earth pathways meander through shrubs, trees, and ground cover that include lychee, papaya, guava, wild ginger, shade coffee, and star fruit. Butterflies are abundant as are aerial visitors from Audubon’s Corkscrew Swamp Sanctuary nearby. But the main stars are the playful exotic birds. For a delightful and surprising outing, take a guided tour with Lohrman to better observe and interact with her avian charges. A guided tour (about 2 hours) is the only way to enjoy the Bird Gardens of Naples. You’ll meet the intelligent lime-green and sky-blue Quaker parrots, the “true hippie chicks of the bird world,” and as close to indigenous as nonnatives can get. Snuggle up to Blaze and Glory, a pair of rare Bolivian military macaws whose bright scarlet plumage has muted to a rusty hue. Gomez and Morticia, fun-loving bare-eyed cockatoos brought from Australia before the 1992 Wild Bird Conservation Act prevented their import, are the oldest on the property, estimated to be about 70 (their offspring, also here, are in their mid 30s). The birds keep the names they come with. Buddy, a Moluccan cockatoo with a lovely salmon crest, needs a lot of attention, explains Lohrman, as we visit his fly space. He lives at the sanctuary because his owner’s neighbors couldn’t stand the noise he makes. Indeed, when we depart his company, his deafening howls make you want to stuff your ears. Lohrman laughs and takes it all in stride. Our tour group of four does the same. Every bird has a story. Lohrman knows all their names, all their quirks. “Popeye, will you do eagle wings?” she coos to a green-winged macaw. Sometimes, but not today, he displays his broad stretch of primary colors. She takes us inside a large space that houses playful macaws and places a massive, friendly bird on the forearm of a willing visitor. Its rough claws hold the bare arm with a gentle squeeze. It’s a thrill. 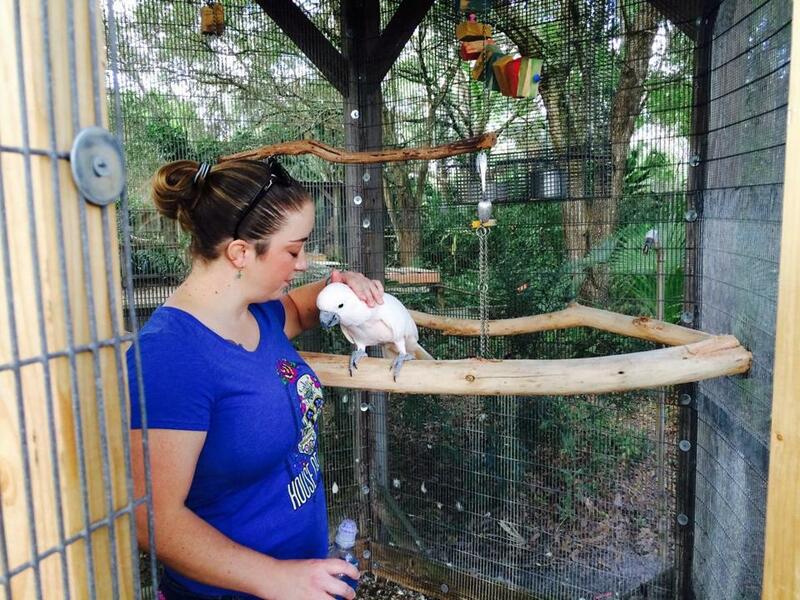 Stephanie Stowell of Fort Myers pets a cockatoo. Look, she says then, pointing to Frootloop’s white facial patch. It’s tinged with pink. The macaw is blushing because he stole a hook from the gate, and she has caught him in the act. She gently teases him. Frootloop is her baby, the last bird Lohrman bred, and the two are thick as thieves. 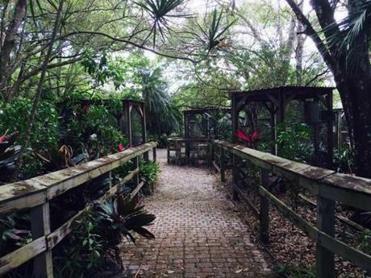 One of the pathways at Bird Gardens of Naples, Keri and Griffith Lohrman’s five-acre Florida sanctuary supported by donations and fund-raisers. Sometimes the birds act like toddlers, laughs our guide. She nuzzles, plays, feeds, and gently scolds her “children,” as each situation requires. Her bird acumen is as impressive as the feathers of the brightest parrot. Another bird creeps close, peers down, and makes sure his caretaker locks the gate as our little group departs. If she’s in a rush and forgets, the macaw will know, time it right, and make an exit. 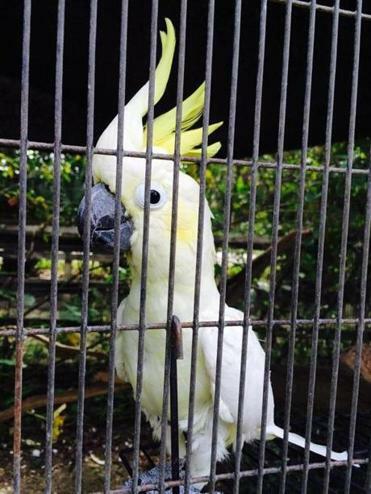 A visit to the Bird Gardens is not only an education in birds but also a glimpse at the world of animal devotion. It’s not uncommon for the Lohrmans to spend $1,000 a month on lumber and supplies. Donations and fund-raisers help the cause. Keri grew up in an animal-loving home in Rhode Island. Her aunt, who raised her, ran Pawtucket’s dog pound, and she spent hours at the Slater Park zoo. She gained her bird knowledge from experience, manuals, online classes, and working closely for many years with “very generous” avian veterinarians. In addition to screening, feeding, housing, and cleaning up after her large brood, she does minor medical procedures. The Lohrmans opened this sanctuary about three years ago, after Keri gave up her avocation as a bird breeder. The couple live on the property and work other jobs — she as a waitress, he as a chef — to support the operation. Their mission is find “nice, friendly birds” a new home by helping them integrate and socialize. They also provide a place for older birds, once used for breeding and thus not suitable as pets, to grow old in comfort. Pet birds often outlast their owners. “Many of these birds will live three human generations,” Keri says. Nancy Heiser can be reached at nancyeheiser@gmail.com.